It is that time of year. The magical time where kids present you with their long list for “Santa” and Christmas catalogs fill up your mailbox. It is also that time of year that you venture into the darkest corners of your house to pull out some of the most spectacular (and sometimes most complicated) decorations that you own. It’s CHRISTMAS!! I am one of the few left that do not put up Christmas decorations until after Thanksgiving. On Thanksgiving, I usually make everybody get decorations down so that over the following days I can put them up. That is at least my intentions, but doesn’t always work out like that. I am very specific how I decorate my Christmas tree, and while it may seem rather regimental, I am very happy with my results that I felt the need to give a breakdown. The first step is to choose a Christmas tree, and with so many options out there, this can be quite a daunting task. Will it be fresh, pre-lit, or colored? I personally went with synthetic pre-lit Christmas trees years ago. Why? Because I like the lights to be perfectly spaced. I once watched a Martha Stewart Special where she showed how to perfectly wrap a live Christmas tree. I do not have a full year or a sleigh full of assistants to wrap a Christmas tree the way she showed. Just a handful of kittens, which are not always helpful but sure are cute! Just like a room, your Christmas tree should have a color scheme. It can be traditional Christmas colors, jewel tones, pastels, country, the options are abundant. This will help guide your overall theme for ornaments. I use a rather traditional theme of red with silver and gold. Vintage Christmas ornaments & poinsettias adorn the tree. I like my ornaments to share a common theme. 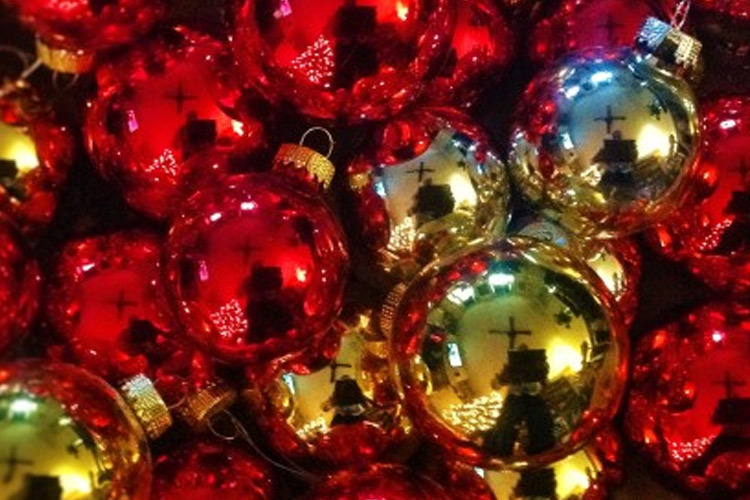 I usually decorate with colored glass balls (they have a beautiful shine, but watch out if they break!) Silver & Gold, with Red. I then reinforce that color scheme with other ornaments such as silver icicles, crystals, and delicate ornaments. I prefer a vintage Christmas. I have paper ornaments that I use, as well as some special ornaments that mark special occasions. I then fill in with gold berry plants, pine cones, and tinsel. Make sure that the ornaments are spaced out throughout the tree, I layer the ornaments nestling pine cones, floral/berries, and small crystals inside the tree branches. You want to make sure that your color scheme is reinforced by placing the colored ornaments throughout the tree and not in just one area. Some of the crystal ornaments I acquired from an old chandelier. Whether you have an old crystal chandelier or pick one up at a yard sale, you can dismantle the crystals, tie a pretty ribbon, and hang. They make great decorations on the Christmas tree, hanging in mantle garland, or any other number of projects. Tree skirts hide all of the ugly stands, and there is so many different options from a simple tie around to faux fur. Choose one that suits your needs and overall theme. I have a red and gold skirt that reinforces my color scheme. I went all out this year by adding presents and an antique train that chugs around the tree. While I save this for the last (just because all of the wonderful Christmas movies make a big show of it going on last) I would highly suggest putting it on first. The last thing you want to do is knock around your carefully placed ornaments while trying to put the topper firmly in place. My ceilings are very short and I had to modify the top part of the Christmas tree and use a wish and a prayer to make sure everything stays in place. There are options from stars, angels, & ribbons. I use a simple star that reinforces my overall theme and is proportional to the overall tree. Voila, my finished Christmas tree. Now that the Christmas tree is decorated, I need to dress up the rest of the room and mantle. I wrapped garland in lights and used similar ornaments from my color scheme. I acquired a vintage house collection that I absolutely love. I placed them on my fireplace mantle to create a little vignette. The “snow” is white batting that conveniently hides all of the ugly wires and cords to the houses. We also made the upgrade to use LED lights inside the houses so that they do not burn hot. My family room is ready for Christmas and a cozy day by the fire.